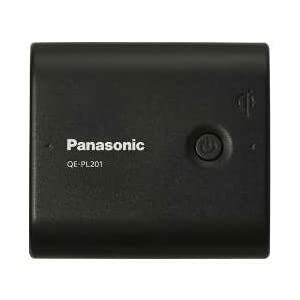 This review is for the Panasonic Qi USB Mobile Lithium Ion 5400mah battery pack model QE-PL201-K. There are many battery packs available from many manufacturers, in many form factors, for a wide range of prices, but the problem is that most of them may as well be packaged air for all the good they will do you. Most of the ones sold in convenience stores aren't rechargeable. Many of these "one-use" devices do let you change the batteries, so they can be "made" to be rechargeable by putting in AA sized NiMH rechargeable batteries, but the capacity is still very limited. The cheaper rechargeable models typically have a small capacity, 1400-2000 mah (or less! ), and most consumers don't know enough to ask about things like this. Sadly, the fact is that many of these smaller batteries don't even store enough power to even charge your smart-phone once, but they still cost 1500 to 2500 yen or more. Off - when not in use. More to the point, since the unit has enough power to charge multiple devices at once, it also has two USB ports. You can charge your iPod and your phone at the same time, for example. Unlike some chargers, this unit puts out enough power to charge an iPad, etc., and also can charge most devices at full speed. In order to charge the unit, there is a micro-USB connector, which can be connected to a computer or dedicated USB charger (which comes bundled with the unit in some packages). While charging, the LED will glow Orange or Green to indicate the charging status, finally turning off when the charge is complete. The unit also contains the proper electronics to charge via the wireless Qi standard, and Panasonic sells a matching charging pad. The best part about the Qi standard is that it is compatible with multiple vendors, so you can use a non-Panasonic charging stand as well. At any rate, the good thing about this battery pack is that you have the choice: You can be a Qi early adopter, or stick with basic USB charging. Given the price vs. capacity ratio, this is one of the best values you can get for your money in battery packs today, and if you don't prepare ahead of time, you will almost certainly get caught buying a junk charger to get you through the night some time or another. Whether the Qi charging is a gimmick or true convenience is up to you to decide, however the Qi 5400 is a good value either way, and something that should be a part of your laptop bag or purse. This is doubly true if you tend to carry lots of gadgets which might need to be charged. If you don't like the squarish form factor, or color selection, however, you can check one of our other battery reviews.